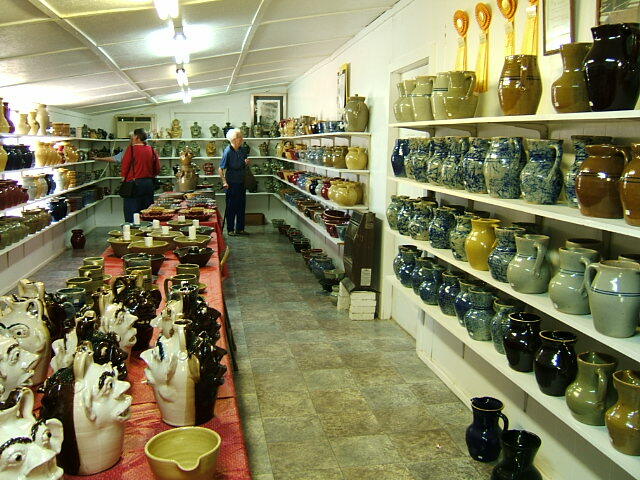 On my visit to north Alabama last week, my sister suggested we go to Jerry Brown Pottery in Hamilton, Alabama. She had bought me one of his mixing bowls a couple of Christmases ago, and had told me about the place, but I had never seen it. 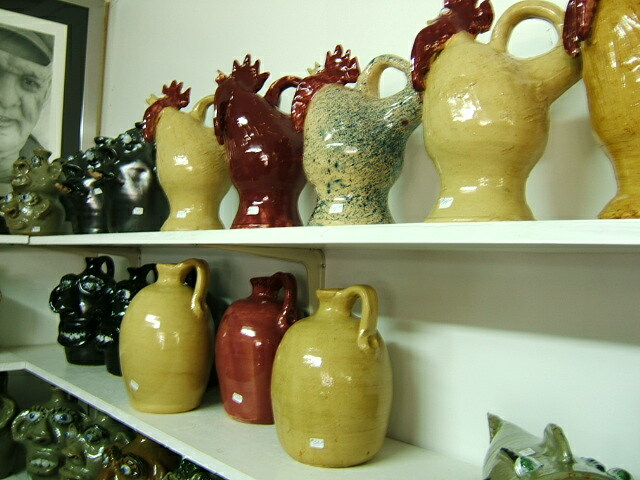 Using the skills learned from his grandfather and his father, passed down through nine generations, Jerry decided to build his own pottery shop in the 1980s. He digs his own clay, processes it with a mule powered pug mill, and fires his wares in a ground hog kiln, all in careful adherence to the original stoneware pottery tradition brought over from Europe in the early history of the United States. There is an excellent article about this process on FolkStreams. Jerry is a true country boy, just about my age. As we browsed through the shop chatting with his wife, I noticed him sitting out on the front porch. I asked if that was Jerry, and she said yes, and told him to come on in a talk with us. The second he walked in the door he began to entertain us with one joke after another. The punch lines were predictable (such as what happens when kids are warned not to use their newly-found foul words at the dinner table) but we didn’t have the heart to spoil them — he was obviously in his element. I felt right at home, since Jokes and story telling are a great and time-honored Southern tradition. Jerry’s family and mine are from neighboring Alabama counties, so we have a lot of similar stories, I suspect. I wish we’d had more time to hang around the shop more, and maybe see where the clay is processed, and I didn’t get to see the hand-built kiln. We were in Hamilton primarily to visit my aunt, who is way up in her eighties. She’s full of stores too. Jerry Brown is one of thirteen recipients of the National Endowment for the Arts’ National Heritage Fellowship Award, the country’s highest honor for traditional artists. I like seeing this Alabama trip. It’s fun! I like the ones with the faces! Awesome. I’ really diggin’ the black and white face pieces along the middle of the gallery. Glad you all like these! John – I forgot to mention that those are Obama/McCain jugs. Limited edition. Expensive!!! It sounds like a wonderful experience, Martha! I love storytellers of all kinds, even the predictable ones. 😉 And what an incredible collection of work he has! 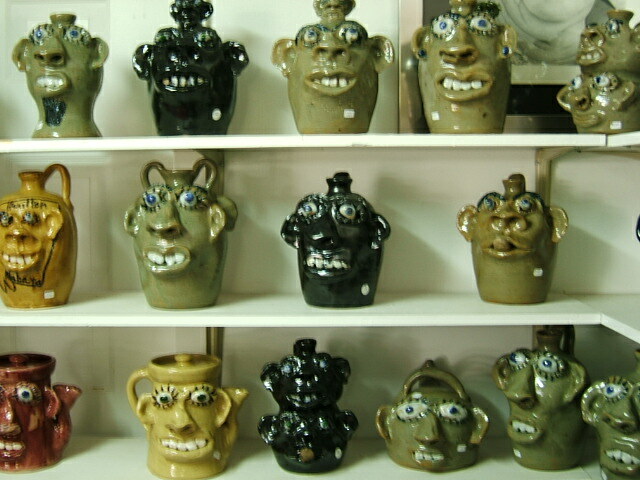 Love the face pots. OMG Martha!!! Obama McCain pots??? That is hilarious. They’re even better now!